Does your child struggle to understand their emotions? For some kids, learning about emotions can be as difficult as learning a foreign language. The Teaching Emotions Toolkit contains all the resources you need to give kids an emotion vocabulary, help them to better understand what they are feeling and what to do with those feelings. *Note: This is a digital (online) product. The Teaching Emotions Toolkit contains all the resources you need to give kids an emotion vocabulary and help them to better understand what they are feeling and why they are feeling it. The toolkit contains printable activities, games and ideas as well as helpful videos. Emotional intelligence is a skill that requires as much intentional teaching as subjects such as math and language arts. For some children, learning about emotions comes fairly naturally but for others, feelings are a bit of a mystery. This can be due to sensory issues, autism, boundary issues, attachment issues, learning disabilities, or just their age or personality. These resources are a non-threatening and fun way to improve their emotional IQ skills in the home or in the classroom. These activities can also help them learn to express their feelings effectively and give them more confidence. 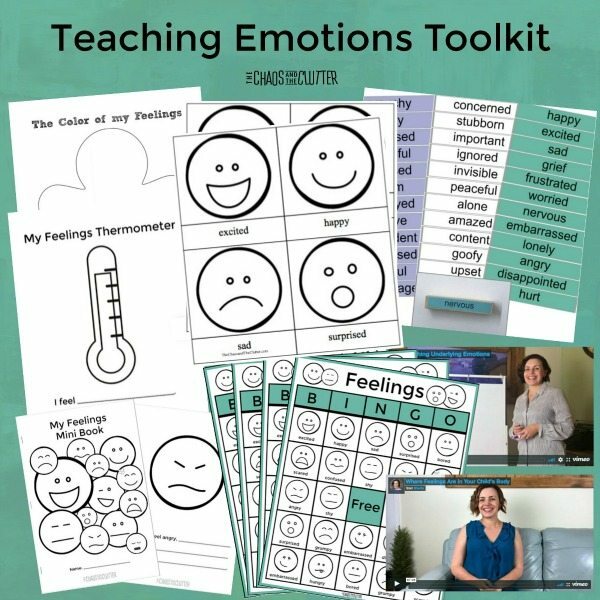 The Teaching Emotions Toolkit will walk you through teaching this skill to children, give you hands-on activities to use with them, give them new ways to express their emotions, and give them the vocabulary they need for better self-awareness. Note: This is a digital (online) product. Upon purchase, you will receive an email order confirmation. In that email, simply click on “Teaching Emotions Toolkit” and you will be taken right to the videos and printable resources.